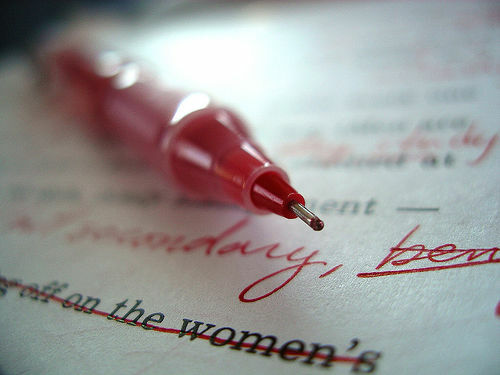 Here are some editing tips that we’d like to share we you. We also have a copy of this article on our website. There are many different ways to edit your work. Some writers edit and polish as they go, while others wait until they have a complete first draft. Allowing yourself freedom during initial drafts without worrying too much about how it all hangs together allows your imagination free rein. Content often gets cut at later stages or as the story changes direction, so over-editing passages or chapters in the early stages can be self-defeating. Look at the structure – how does it all fit together? Look at the scenes, sections or chapters and ask yourself how work to produce an overall effect on the reader? Do these scenes, sections or chapters serve or progress the story? If they don’t – get rid of them. Does the story flow … does it logically hold together? Remember – less is more. One structural edit generally doesn’t do the job. There’s no rule of thumb but most writers will do at least three or four drafts, with many writers doing a great deal more. Read your work aloud as it shows weaknesses and inconsistencies in language and rhythm. Is the writing stylistically coherent? Are your sentences too long, too wordy, all the same length? Does the writing have rhythm and pace? Does each sentence, paragraph and chapter convey what you intended or have you gone off track? Do you have passages or chapters that serve the same purpose or effect? Do you have repeated phrases, overused favourite expressions or clichés that need trimming? This means checking spelling, grammar and syntax. Have character names or descriptions changed during various drafts? Is the chronology of events correct? Are events in the right temporal order? Watch out for repeat words, especially close together in the text as they jar the reader’s eye. At this point your manuscript should be ready to send off to a publisher or for you to get the opinion of a professional editor or manuscript assessment service.